How does a quadcopter even fly? Quadcopters use four motors with four propellers to create thrust to give the aircraft lift. Two of the motors rotate counter clockwise and the other two rotate clockwise. 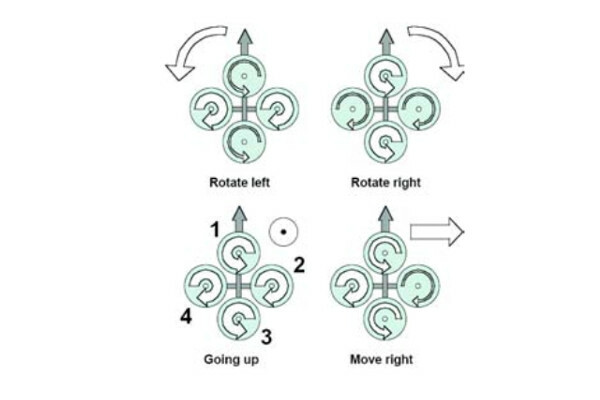 This configuration cause the torque from each motor to cancel by the corresponding motor rotating the opposite direction .What is very different about quadcopters from other vertical take off and landing aircraft (VTOL) is that in order to control pitch, yaw, and roll the pilot uses variable thrust between the four motors. For example, the image below helps to illustrate which motors a pilot would have to speed up or slow down in order to maneuver. If he wanted to move right, he would decelerate his far right motor, accelerate his far left, and keep the two motors parallel to direction of motion at a constant speed. Most of what makes quadcopters even possible for novice pilots to fly is the breakthroughs in small micro controller technology. In the beginning quadcopters had large pilot workloads to fly because each motor had to be individually controlled simultaneously. With today's technology, computerized flight controllers with algorithms can make the on the fly decisions for the pilot based on his input via the radio controller sticks and controls. 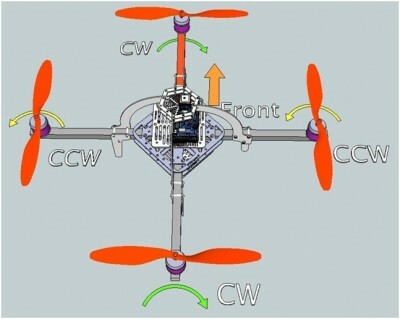 Below is an illustration of what the electrical looks like in a typical modern quadcopter. Quadcopters and other unmanned vehicles come with added bonuses with added caveats. They may be easier to fly now with new technology, but because the pilot is not on board the aircraft, this adds many other challenges in regard to situational awareness. Many quadcopters are outfitted with on board cameras to give the pilot first person perspective when flying. However, even with optics many precautions still must be taken to ensure a safe flight such as pre-planning routes, making obstacle maps, and being within line of sight in order to make the best judgement calls.